Yesterday, I took a drive. A drive that was intended to last until the sun had gone down. It did. I drove for over 300 kilometers. I had no real direction in mind other than the general area I outlined on this map. I didn't follow it, the map exactly, I used a bit of follow your nose approach with some new school technology and old school technology thrown together. Despite the huge amount of rain I encountered, I saw some wonderful locations and managed to make a few pictures, some on film, 3 rolls of 120, and about 80 or so iPhone pictures. Some of the iPhone pictures were intended as simple documents of place, to be used back home when loading them into Aperture, others 'on the fly' little 'artistic, creative vignettes' that alluded to where I was geographically, and metaphorically. Some of the creative vignettes, were uploaded to multiple sites, as I went, those sites being, tumblr, posterous, and instagram. [instagr.am is an unusual site, you actually NEED an iPhone to access it, the web site is just a small footprint of the larger experience, which adds another layer of complexity to my in situ editing and uploading choices]. The light was a bit hit and miss, and as a consequence, I plan to revisit these places, when the light is better. This was my first successful attempt at mapping myself using these technologies. The first in Sydney last year failed, more because of the tools I was using than anything else I think. Anyway I am pleased I have made some headway in my efforts to put together a body of work, both on the fly, and in situ, and using hindsight and reflection. My biggest concern on the day was not having any mobile reception, or rather enough reception. As it turns out, there are some dead spots much closer to the city than I would have thought and areas like near the Heathcote/Graytown National park surprisingly well serviced, go figure? The red dots are the markers placed by the software, I use to organise photographic projects, in conjunction with my phones built-in GPS coordinates. The first thing I have learned is that, I need to make more pictures more often, and perhaps working alone, especially in a car may not be the best way to work. One aside, late last year I was bemoaning my options regarding a new iPhone blog I wanted to get off the ground, well it is up and running and in full swing, I hope to continue to upload an image a day, every day for the foreseeable future. This image comes from a flickr stream, by, Eric Fischer, in particular his set, Locals and Tourists Set. Red is for tourists and Blue for locals, yellow being for indeterminate photographers. I am surprised by the large amount of blue to the North of the city? And disappointed by the lack of blue to the West, MY neck of the woods. From the map below you can see, that the corridor of images, that flickr deems the most interesting forms a relativley narrow corridor, running roughly East to West. No surprises really here, as these are the places I spend the most time at, home and work. I does give me an pointer that maybe I need to exapnd my explorations and see what I can come up with, Brusnwick for example, a suburb north of the CBD, is a rich area of post-industrial sites, in varying states of use. I think it is quite apparent that my 'place' is in this East West corridor. 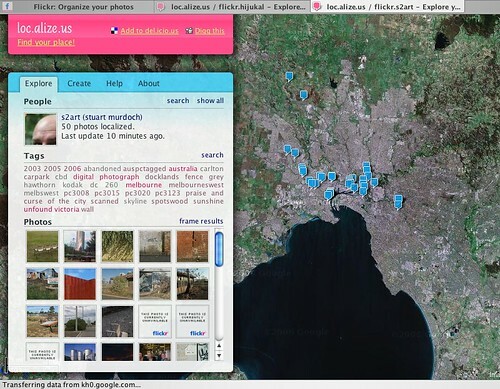 Another Meme has popped up on flickr, is it, however; a separate meme or part of the geo-tagging meme?